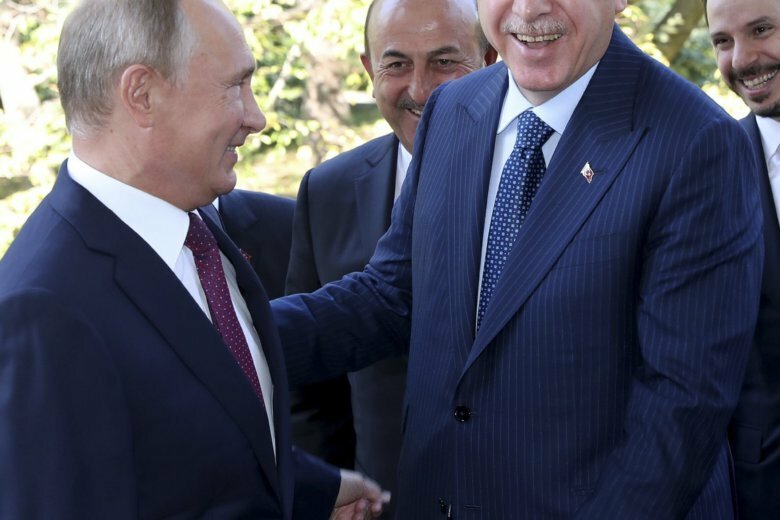 BEIRUT (AP) — Both Syria’s government and its opposition welcomed the Turkey-Russia deal declaring a de-militarized zone around the major rebel stronghold Idlib, saying Tuesday the agreement stemmed more bloodshed. On Monday, Russian President Vladimir Putin said the demilitarized zone is to be established by Oct. 15 and be 15-20 kilometers (9-12 miles) deep to separate Syrian forces and the rebels, with radical groups withdrawn from the area. The zone will have troops from Russia and NATO-member Turkey conducting coordinated patrols to monitor the demilitarization and restore traffic to the highway linking major Syrian cities that passes through Idlib. Without the agreement, “there would have been no opposition left,” Cavusoglu said, calling it crucial for a lasting political solution. Cavusoglu also said Turkey would need to dispatch more troops to patrol the area, along with Russia, while retaining its 12 observation posts. Iran’s U.N. Ambassador Gholamali Khoshroo called the Russia-Turkey agreement on Idlib the “right step” toward fighting terrorism and restoring peace to Syria without hurting civilians. Idlib is home to some of the government’s staunchest opponents, including civilians and insurgents. Insurgent groups include al-Qaida-linked Hayat Tahrir al-Sham — or Levant Liberation Committee — the Turkistan Islamic Party and Horas al-Din, or Guardians of Religion. Speaking against the deal, some in Idlib said they feared it would pave the way for a massive attack. The Hayat Tahrir Al-Sham-affiliated Ibaa news agency compared the deal to the 1993 U.N. agreement in the eastern Bosnian town of Srebrenica that ended two years later with the massacre of 8,000 Muslim men and boys and the displacement of thousands of women at the hands of attacking Serbian fighters. The agency also said the deal was a “follow-up” to previous “de-escalation” agreements which resulted in opposition areas “being handed over” to the government. Abu Yaqzan al-Masri, a religious judge affiliated with HTS, said the coming days will be “full of surprises” and warned against the rebels giving up their weapons. He said some will attempt to spark infighting to rid the area of jihadists and help the Turkey-Russia deal. An HTS spokesman said the judge’s view doesn’t represent the political position of the group. “Those who ask you to give up your weapons should be the first to fight,” he said. Associated Press writers Albert Aji in Damascus, Syria, Zeynep Bilginsoy in Istanbul and Fadi Tawil in Beirut contributed to this report.